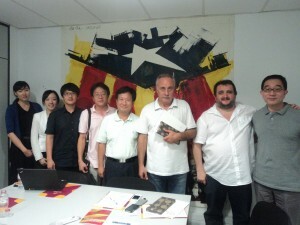 On August 22, a team of social scientists from Seoul National University´s Graduate School of International Studies met Dr. Joan Carretero, President of RCAT. 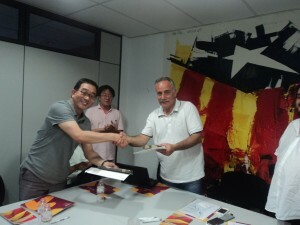 The purpose of meeting, requested by the Korean team, was to know the Catalan political scenario and the growing relevance of the Catalan Independence Movement. The interview is included in a research project that also studies other European stateless nations. The Korean team was headed byProfessors Geun Lee, Chong-Sup Kim, Oung Byun and Seongho Sheen and three Research assistants. From RCAT side, also assisted International Relations officers, Josep Sort and Esther Ponsa. The research also counts with the cooperation of Korean National Diplomatic Academy and the Ministry of Unification. The meeting took place in an atmosphere of cordiality and mutual understanding.